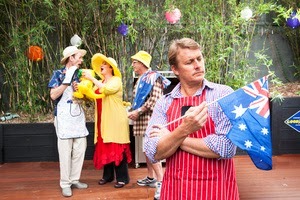 ON January 25 The Queensland Theatre Company will open the bang-up-to-the-moment barbecue-stopper of a comedy, Australia Day. To mark this season-openeer, the award-winning Emporium Hotel has announced a special extension of their Summer Celebration package, now exclusively bookable for the season of QTC's Australia Day. EMPORIUM Hotel can also access tickets to Australia Day for guests. Brisbane's multi award winning Emporium Hotel's (current holder of the Best Luxury Accommodation title at the Qantas Australian Tourism Awards 2013) Summer Celebration 2013/2014 accommodation package featured an overnight stay in a luxury King Suite, valet parking (usually $35 per night) and late check out to 12 noon. This summer experience is priced from $229 per night and valid for stays from 20 December 2013 to 16 February 2014*. The extension is exclusively for Australia Day ticket holders. *Conditions apply. Subject to availability. With Australia Day, starring well known TV actor Paul Bishop (cast quite comfortably in the role of the Mayor - when he's offstage, he is a Redlands City Councillor on Brisbane's bayside) together with leading actors Chris Betts, Louise Brehmer, Barbara Lowing, Bryan Probets fresh from the acclaimed Design for Living and Lap Phan under the directorial leadership of super talented theatre star Andrea Moor, Australia Day is expected to attract visitors to Brisbane from all over the country. It's thought-provoking yet wickedly funny exploration of authenticity and idealism in the melting pot of modern Australia is an experience worth traveling for! And it's a great opportunity to explore Brisbane - the city in the spotlight for the G20 meeting in November 2014.